I saw this movie over the weekend after all the hype about how crap it was and the fact that Sandra Bullock picked up a raspberry (worse actress) award in 2010 for it before her Oscar in "The Blind Side". I really like Sandra Bullock so either way it shouldn't be too bad? or so I thought. Sandra Bullock plays a character called Mary who is a crossword creator. On a blind date set up by her parents, Mary meets Steve, a supposedly "hot" cameraman (Bradley Cooper-could've been hotter) and instantly sets her eyes on him, who gets freaked out. Mary's obsessive compulsion brings her to follow Steve to his on-the-road style journalism, only to be told to go back home. Spurred on by Steve's reporter crew played by Thomas Haden Church, Mary continuously follows, despite being rejected to the face. Meeting friends on the way, Mary's road trip turns into an adventure as she faces danger and creativity, her final feat brings her to find herself more loved than she ever thought she could be. I thought the plot was weak throughout. The characters (except for Mary) are dull and flat. With sweet intentions, this film does carry a strong message, just that it didn't come through in an enjoyable way. That said, there are small snippets of this movie that do make you go Aww, or smile about. The incorporation of the crossword theme and all the analogies for some reason did it for me- I did like those. What I didn't like was the need for the character of Mary Horowitz to be so obsessive and in a way naive. I could dig deep and pull out a whole range of meaning this film could bring and how great it would be, but they wouldn't be obvious to the average viewer, and as a film that is supposed to entertain, it lacked even basic ingredients. The ending was surprisingly good for a film that's so bad up to this point. I'm fed up of typical rom-com endings, and this one definitely is a feel-good ending that doesn't force love between characters for the sake of it. 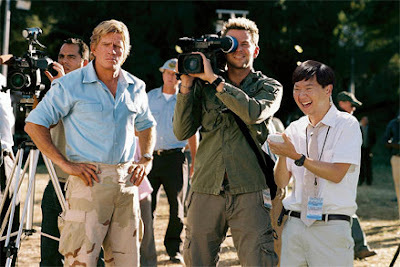 Also stars Thomas Haden Church, Ken Jeong and DJ Qualls. Sandra Bullock is the only one who truly shines in this. Despite Mary being an eccentric and ditzy character, Bullock makes it believable and puts her own style to the role. Even though this film is pretty much a flop, you'll remember Sandra for it. Plus, she looked surprisingly good in that mess of a hair and those boots! The film as a whole is a terrible flop. Several moments in the movie does make you smile and there is a strong message buried in there. However, many will not manage to sit through an hour and a half to find it. Sandra Bullock, despite being given such a dodgy character, stays consistent and focussed throughout. You can see she is dedicated to the role. In this way, I don't think she deserved the raspberry, as she did a great job putting on a flawed character that was "less than beleivable", yet making it her own. See it for Sandra if nothing else.